I attended last Thursday a Nonviolent Communication course. The theory is about how to identifying your needs and how to give your communication partner the possibility to identify his. We fulfill our needs or we don’t and this is the cause of our positive or negative feelings. I asked why does my 3 years boy cry when I leave him in the kindergarten and how shall I act to make him understand my needs. Discussing with the trainer I realized the following, my child needs to feel safe and my need is him to be safe and happy. I also realized that my experience in the childhood with the kindergarten was a similar one. I was always crying and afraid that my parents will not come back to pick me up. I believe that our children choose to appear in our life because they want to show us the way we are and to help us to solve our problems. I profoundly believe that I am deeply connected to my children and MY feelings are obviously visible in THEIR behavior. 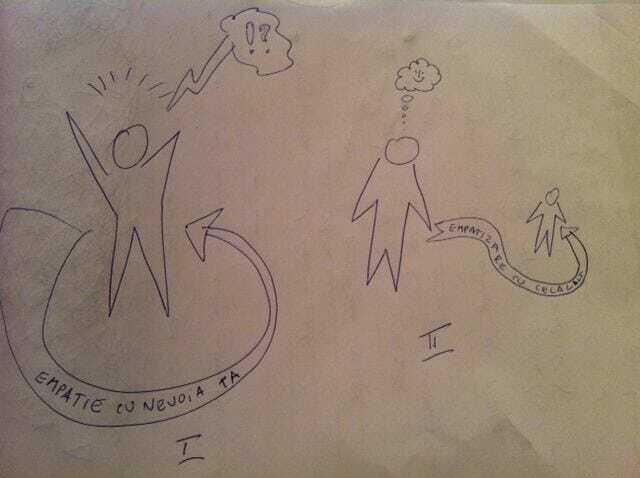 Here my drawing in the Nonviolent Communication course before the experience. I empathize with yourself and II empathize with the other.